"I read this book recently [below]. It would appear to me that this “screening instrument” has been re-labelled. I should confirm that I use rating scales with patients as part of my daily professional life. However I would never start out with a rating scale. To me, that would seem most disrespectful. Rating scales (‘tools’ or ‘instruments’ as so recently re-termed) can add to wider medical understanding. This is why, despite my awareness of any intrinsic shortcomings, that I continue to feel that they can be helpful. 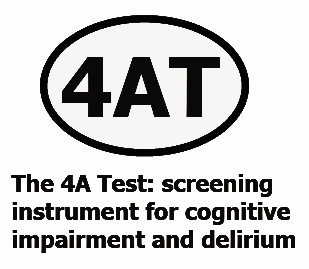 The 4AT, an “assessment test”, is based on “brevity” and the requirement for “no special training”. The 4AT test, however labelled: can it continue to ignore Wilson Jungner?" "As petitioner for a Sunshine Act I recently met with the Scottish Health Council regarding consultation with the public on my petition. Since this meeting I have been reflecting on how the Scottish Health Council may go about such a consultation given the various options that we discussed. I have also sought confirmation as to whether the Scottish Government has allocated any resource for this public consultation. I share the ambition of the Scottish Government that we seek views as widely as possible across Scotland given the importance of this petition.I think that it would be sensible for the Scottish Health Council to take a variety of interactive approaches and methods. I am also aware that not everyone is online and so perhaps there is need to consider paper questionnaires which might also be sent to community interest groups. Another approach would be through qualitative in-depth interviews, semi-structured, with individuals. This should be with a mix of ages and backgrounds, and geographic areas. It would be sensible to include open-ended questions as well as more direct closed questions. I wonder if the Scottish Health Council could also target focus groups already in existence and write to them, asking to visit and facilitate a discussion. My petition has been considered 6 times now by a parliamentary committee and has generated a lot of evidence which has been carefully considered. I would wish, as petitioner, to see a proportionate input on public consultation. My view is that this is an important matter that may have significant consequences for the best possible approach to Scottish citizens requiring healthcare. I do hope that the Scottish Health Council is given sufficient time and sufficient resources to undertake a meaningful public consultation. The Scottish Government has repeated several times, that as the petitioner, I am virtually alone as a healthcare worker to have raised concerns about lack of transparency in NHS Scotland. I would strongly suggest that this may reflect the sort of NHS culture that Robert Francis has described in recent reports, where staff are fearful of the consequences of raising issues such as this. Sunshine Act: what is it and why might it matter to you? In September 2013, Dr Peter J Gordon petitioned the Scottish Parliament to consider introducing a Sunshine Act for Scotland. The parliament has now considered this petition on 6 separate occasions and, having gathered much evidence, now wishes to seek the views of the Scottish public. A Sunshine Act has been introduced in both France and America. The Act would make it necessary (a statutory requirement) for all healthcare workers and academics to declare any financial interests on a regular basis. These financial interests would be recorded in a single, searchable register that is fully open to the public. We know that in one year £40 million was paid by the pharmaceutical industry to healthcare workers and academics in the UK. It is likely that approximately £4 million of this was paid to Scottish healthcare workers and academics. Payments most often relate to the provision of sponsored medical education in the forms of honoraria or for being Advisors to Pharmaceutical Boards. The amounts paid to individuals can be significant. One NHS Consultant said to me at an educational meeting “I was paid £3000 for this talk and I do not even prescribe the drug myself”. The pharmaceutical industry, on average, spends twice as much on marketing activities as it does on innovation and developing new drugs. Last year, BBC Panorama, did a programme “Who pays your doctor?” It was watched by 2 million viewers. Panorama argued that we expect far higher standards from our politicians than we do from healthcare workers. The concern is that if healthcare workers are “educated” by those whose first loyalty is to shareholders then scientific impartiality may suffer. Current systems for declaring financial interests are failing in Scotland. No board in NHS Scotland has properly complied with the Scottish Government Guidance on transparency issued more than 12 years ago. Only a tiny proportion of the £4million known to be paid to healthcare workers by the pharmaceutical industry has been recorded in NHS Scotland registers. Forty-four separate SIGN Guidelines, all currently in operation, have no records of the financial interests of those tasked to draw up the guidelines. This is concerning as these guidelines are generally followed by doctors to inform prescribing decisions for a wide range of medical conditions. Education to healthcare workers is also provided through attendance at conferences. Most large conferences include “key opinion leaders” who may have been paid by industry to give their talk. Research for this petition has demonstrated that there is no consistent system for recording such financial conflicts of interest amongst the multiple different responsible bodies, such as the Royal Colleges and other professional bodies. It has been argued that regulation, such as a Sunshine Act, might be an administrative burden and costly. However a single, central register (rather than multiple failing registers) has been found in the USA and France to be relatively simple to set up and administer. Furthermore a single register will cost significantly less than current multiple systems which all overlap and do not provide anywhere near full transparency. The Association of the British Pharmaceutical Industry (ABPI) has set up a register of payments to begin next year. Unfortunately any individual can opt out of revealing any payments made to them. Given my research for this petition it is my certain view that the ABPI register will not ensure meaningful transparency and we will have no idea who received the £4million. As a patient you will have no idea if the doctor prescribing medication to you in NHS Scotland has received payments or been educated by those who have received payments. Our collective healthcare needs to be based on scientific objectivity and such cannot be assured if we have no meaningful transparency. A Sunshine Act is the only way to ensure this." "In August 2013 I read an article published in the BMJ which was entitled “Three quarters of guideline panellists have ties to the drug industry”. I have petitioned the Scottish parliament for a Sunshine Act. My petition seeks a single, searchable register of payments made to healthcare workers and academics. 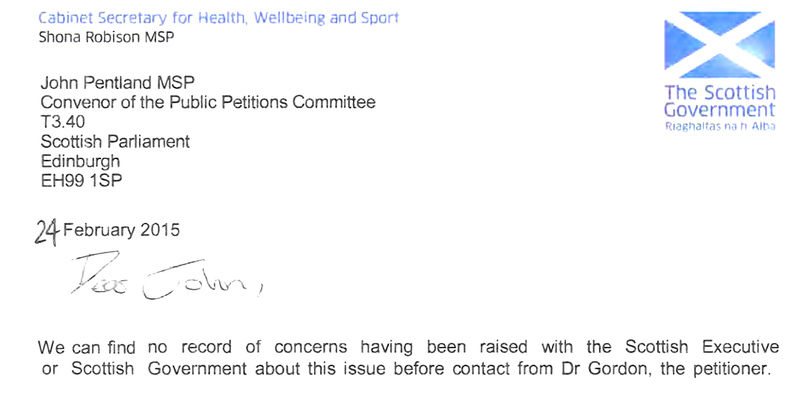 My petition has now been considered 6 times by a parliamentary committee. The committee would appear to be coming to the view that such a register would need to have statutory underpinning (just as they have in France and the USA). However, before any decision is made by parliament, the Scottish Government have asked for wider public consultation. The Scottish Government and the Cabinet Secretary for Health, Wellbeing and Sport, have made comment that apart from the petitioner the issue of transparency has not been raised by other NHS healthcare professionals. This brings me to this blog-post which might explain why this has been the case. In an entirely anonymised way I shall briefly present the narrative behind a senior healthcare professional who served as a key individual in a panel developing a national guideline. Unfortunately no records of financial interests for this guideline exist and so, as part of my research for a Sunshine Act, I wrote politely to this senior healthcare professional asking for the details of any financial conflicts of interest. I was grateful to receive responses but unfortunately found that they were uninformative and defensive. It was however clear from research publications that this individual had received payments from the pharmaceutical industry. In Scotland, all NHS Chief Executives were written to by the Scottish Government in 2003 asking that they established registers of interests for all employees including GPs. However, across Scotland, for more than 12 years, this guidance has not been followed. In the hope that this senior healthcare worker had declared to his employers, I wrote to the Health Board involved. In doing so they breached my polite request for anonymity . I asked the Health Board if they could forward the evidence of this senior healthcare worker’s declaration to his employers, as expected in HDL 62 and also for GMC Annual Appraisal. After many months, I received a reply from the NHS Board. This is the relevant section of the reply which confirms there are no entries for this senior healthcare worker who was involved in developing a national guideline which advises on prescribing. The NHS Board reply encouraged me to consider confidentiality of this senior healthcare worker but made no apology for my anonymity being broken. The final paragraph of the NHS Board reply apologised for the time taken to look into this but asked me to “appreciate that this is a most unusual request”. My experience for researching whether GMC guidance and extant NHS Scotland guidance on transparency have been followed has been most difficult. It has had negative consequences for me and I have felt as if I have been regarded as “unusual” to be concerned about transparency. 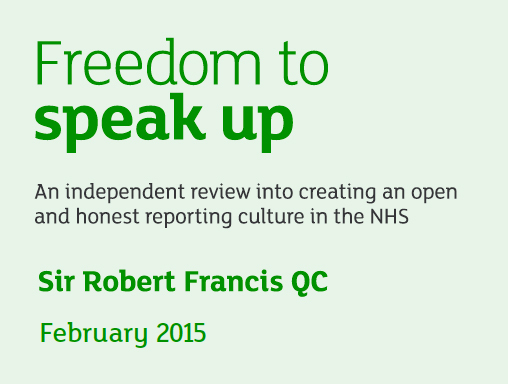 Robert Francis in his two recent reviews relating to the NHS has talked of ‘a culture of fear’ where healthcare workers are fearful of the consequences of putting patients first. Perhaps then, this is why, other healthcare workers have not raised concerns about transparency of payments made by industry to colleagues. It would appear from this example that it is possible that authors of prescribing guidelines may have previously been paid by industry. As things stand there is reasonable chance, as a Scottish patient, that the medication you receive has been informed by such a process. And you will have no way of finding out if this is the case." "The Council for Evidence-based Psychiatry invites you to join global leaders in the critical psychiatry movement for a one-day conference which will address an urgent public health issue: the iatrogenic harm caused by the over-prescription of psychiatric medications. £70 early bird rate for delegates until 30 June!" Deadly Medicines and Organised Crime: This is the homepage of Professor Peter C Gøtzsche, Director of The Nordic Cochrane Centre. Contact information: www.cochrane.dk. Peter graduated as a master of science in biology and chemistry in 1974 and as a physician 1984. He is a specialist in internal medicine; worked with clinical trials and regulatory affairs in the drug industry 1975-1983, and at hospitals in Copenhagen 1984-95. He co-founded The Cochrane Collaboration in 1993 and established The Nordic Cochrane Centre the same year. He became professor of Clinical Research Design and Analysis in 2010 at the University of Copenhagen. 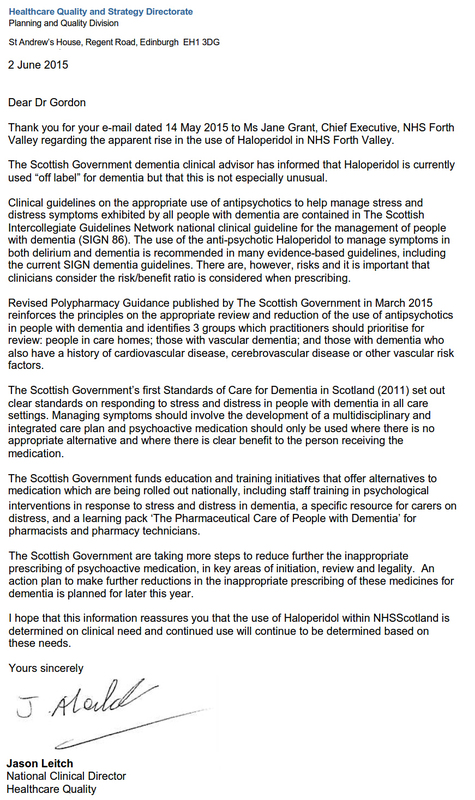 "In a previous post the FOI returns on Haloperidol prescribing in NHS Scotland were shared. This followed on from my consideration of a BMJ report regarding the scale and potential harms of such “off-label” prescribing to our elderly in hospital. I was most grateful to receive your letter of reply dated 2nd June 2015. I thought it best to reply to you to clarify the focus of my concerns. I wish to try and keep my reply short and focussed on the points you raise. SIGN 86 was criticised in this research: Knűppel H, Mertz M, Schmidhuber M, Neitzke G, Strech D (2013) Inclusion of Ethical Issues in Dementia Guidelines: A Thematic Text Analysis. PLoS Med 10(8): e1001498. doi:10.1371/journal.pmed.1001498. I find it disappointing that an outdated and flawed guideline is still the basis for prescribing in dementia. Haloperidol prescribing is part of the “Comprehensive Delirium pathway” introduced across NHS Scotland by the Scottish Delirium Association (SDA) and Healthcare Improvement Scotland (OPAC). You will be aware of this as I note that you are giving the key-note talk this week at the conference: “Transforming delirium care in the real world”. Over a year ago the Secretary of the Scottish Delirium Association asked me to summarise my views on delirium improvements happening in Scotland. I did so and shared these with the SDA and with OPAC. I am disappointed to note that no reply has been forthcoming. I attach this summary for you with this letter. It is welcome to hear that the Scottish Government are taking actions here. It is the case, by Scottish Government figures, that antipsychotic prescribing is increasing year-on-year in NHS Scotland. I seek improved care for individuals with delirium and dementia. I am concerned that current approaches, along with staff shortages and increased demands on staff time, are making it more rather than less likely that our elders may receive antipsychotic medication that can result in significant harms. Summary of considerations on delirium improvement work in NHS Scotland (March 2014)"
Live Link to Committee Room 4 (James Clerk Maxwell Room) where Public Petitions Committee meeting is being held. 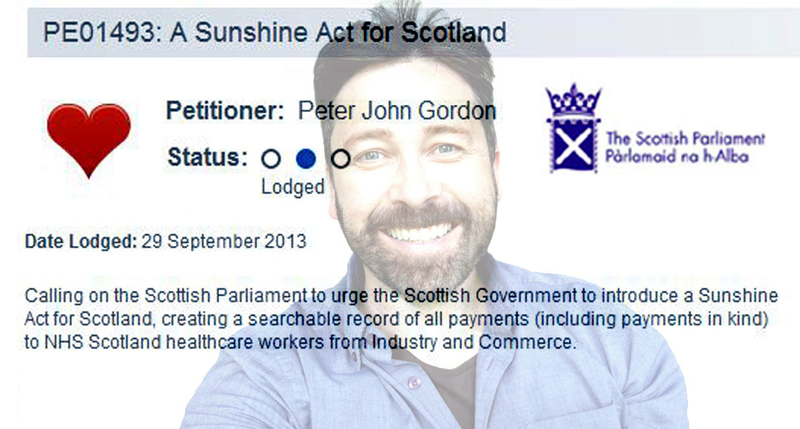 "I have petitioned the Scottish parliament to urge the Scottish Government to introduce a Sunshine Act for Scotland, creating a searchable record of all payments (including payments in kind) to NHS Scotland healthcare workers from Industry and Commerce. The Association of the British Pharmaceutical Industry have recently introduced a "Central Platform" to record payments to healthcare workers. Unfortunately there is an OPT-OUT so it may not provide the transparency that I believe we require when it comes to financial conflicts of interest. (2) "Piggy in the Middle" by Belle & Sebastian for BBC Scotland"
18 March 2015: 31 March 2015: Sunshine Act for Scotland Public Petition PE1493 @ScotParl. Again. I'm looking for action. Many examples of corruption can be detailed, and it is easy to see why this impairs any societal—or scientific—discussion about the longer term merits of psychiatric drugs." Whitaker R, Cosgrove L. Psychiatry under the influence. Palgrave Macmillan, 2015. Kennard B. Assessment of safety and long-term outcomes of initial treatment with placebo in TADS. Am J Psychiatry2009;166:337-44. Vitiello B. Suicidal events in the treatment for adolescents with depression study (TADS). J Clin Psychiatry2009;70:741-7. Rush AJ. Acute and longer-term outcomes in depressed outpatients requiring one or several treatment steps: a STAR*D report. Am J Psychiatry2006;163:1905-17. Pigott H. Efficacy and effectiveness of antidepressants. Psychother Psychosom2010;79:267-79. Pigott H. Star*D: a tale and trail of bias. Ethic Hum Psychol Psychiatry2011;13:6-28. Full response BMJ: Re: Does Long-Term Use of Psychiatric Drugs Do More Harm Than Good? Anybody who has read my writings on Hole Ousia will be aware that I have a dislike of the current mechanical language that would seem to be particularly favoured by healthcare improvers. So I am not convinced that a tool like a “costometer” (had it been invented) would manage to measure the outcomes that really count! It is my impression that we seem to have many more conferences today than we once did. Sometimes it is the case that one finds that these conferences involve the same speakers covering well rehearsed topics. One such recurrent topic is “awareness”. It often seems to me that there may be less “awareness” of interests that may lie behind such conferences. Here, please do not be tempted to think that I am referring to the pharmaceutical industry alone. 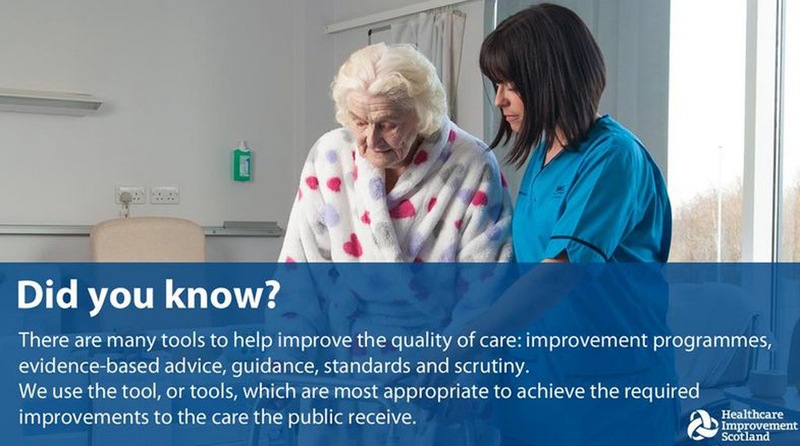 It is the case that many conferences today are those organised by charities, Royal Colleges, health improvers, third sector agencies and by government bodies. The “costometer” is an invented tool. If it did exist, could it really measure the true value of all these conferences?"